In honor of some new laws that took effect this year, THE DARK VAULT OF PUBLIC DOMAIN gets organic this week. Join UNCLE PETE and El Vato as they roll out the green carpet this Saturday night with a bona fide cult classic scare film and one of our fan favorites – REEFER MADNESS. Released in 1936 as Tell Your Children, an anti-marijuana educational film, it stars Carleton Young as Jack and Thelma White as Mae – a couple of scurvy pot dealers. It also stars one of the DARK VAULT’S favorite actors – Dave “Tex” O’Brien – as Ralph, a strung out, unbalanced ex-college student (someone we can relate to). They soon get youths Jimmy (Warren McCollum) and Bill (Kenneth Craig) turned on to some “real good cigarettes”, starting them on a downward slide into the dark, destructive world of cannabis. Reefer Madness is a big departure in the career of Dark Vault favorite Dave “Tex” O’Brien who spent much of his long career in East Side Kids movies, Pete Smith Specialties, and westerns (many with Tex Ritter). Reefer Madness, intended as an educational movie to warn parents about the pitfalls of pot, became a cult movie legend after NORML founder Keith Stroup bought a cheap copy in 1971 and began to circulate it in the college movie circuit. Meanwhile, back at the Dark Vault, El Vato’s incense (or something) has a bit of an effect on UNCLE PETE. 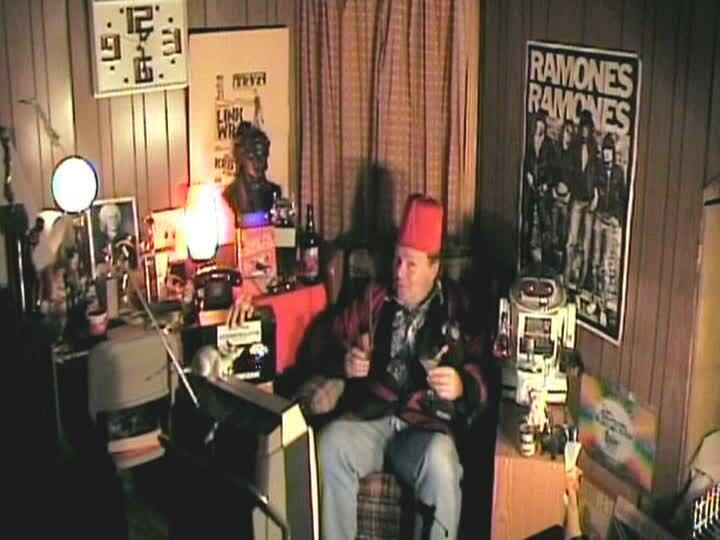 But while UNCLE PETE relaxes in the den, he brings you an assortment of stuff including a film from the 60’s called Keep Off The Grass and a musical interlude called Radiation Baby. Azul stops by to demonstrate a new use for a Vito Gold product, and UNCLE PETE tickles the ivories between assorted refreshments and snack breaks along the way. So grab lots of munchies and turn on (your TV set) and tune in this Saturday night, January 14, 2017 from 10PM to midnight on channel 4 (Binghamton), channel 99 (Elmira/Corning/Hornell and Utica/Rome), channel 17 (Sayre/Montrose, PA), and channel 30 in the North Country (Ogdensburg/Watertown/Massena/Malone/Champlain) with replays at midnight and 2 AM. It’s murder, debauchery, and some jazzed up piano playing as UNCLE PETE goes green this Saturday with the 1936 cult classic Reefer Madness, our feature presentation on the next DARK VAULT OF PUBLIC DOMAIN. ~ by UNCLE PETE on January 14, 2017.